Standley Feed & Seed loves carrying unique gift items for our customers like Fat Mama’s treats. Come check out our line of Fat Mama’s products, including “Knock-You-Naked” Margarita Mix and “Fire & Ice” Pickles. These fun treats make the perfect gift this holiday season. Grab some for yourself to put a fun spin on the holidays! 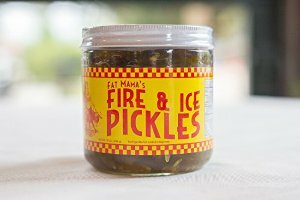 Fat Mama’s Fire & Ice Pickles are homemade, pickles with the perfect combination of sweetness and spicy married together to create the perfect pickle! Fat Mama’s Knock You Naked Margarita Mix is a fun, small, potent concentrate of margarita mix. Find both these Fat Mama’s products at Standley Feed & Seed in Madisonville, Texas. This entry was posted on Monday, October 10th, 2016 at 2:33 pm	and is filed under News & Updates. You can follow any responses to this entry through the RSS 2.0 feed. Both comments and pings are currently closed.